Francis Wheen. Fourth Estate, London 1999. ISBN 1 85702 637 3. £20.00. KARL MARX died in 1883. Only eleven people turned up at his funeral. In his graveside oration, his lifelong friend and comrade, Friedrich Engels, eulogised him as a revolutionary genius. He predicted that ‘his name and work will endure through the ages’. Who was this man? What did he do? Why has he become so influential? William Pierce, on the other hand, has yet to have as much historical influence as Karl Marx. Until his death in July 2002, Pierce had been the most influential personality on the extreme right in America. He wrote the notorious novel, The Turner Diaries, which was credited with inspiring Timothy McVeigh to blow up the Murrah federal building in Oklahoma City in 1995. Today’s ‘Marxists’ are usually as dogmatic and fossilised as any Puritan divine, but the man himself was a great original thinker. He discovered that the lot of workers in a prosperous society is not all that great. Although the demand for workers exceeds supply, and thus wage rates can rise, the effect is a greater concentration of wealth in the hands of a handful of big capitalists. “The big capitalists ruin the small ones and a section of the former capitalists sinks into the class of the workers which, because of this increase in numbers, suffers a further depression of wages and becomes ever more dependent on the handful of big capitalists. Because the number of capitalists has fallen, competition for workers hardly exists any longer, and because the number of workers has increase, the competition among them has become all the more considerable, unnatural and violent.” Added that is the competition from machines. Another factor in driving down wages, which Marx did not predict, was the importation of cheap labour from Third World countries. Marx took the view that the only defence against capitalism was competition, which raises wages and lowers prices. This is the reason the big capitalists try to drive competitors out of business while paying lip service to the notion of ‘choice’. Marx’s life was spent seeking to find a solution to this grave problem through socialism – the dictatorship of the proletariat – and the abolition of private property. This was a blind alley. The way to overcome the monopolising effects of capitalism is not the abolition of private property or total state control (as practised by Marx’s latter-day professed disciples) but widely diffused property. Pierce, on the other hand, had little interest in economics and ideas of social justice. His view of society was organic and spiritual. Like Marx, he believed that life is a struggle. To Pierce, Western society’s ills were the result of decadence, luxury, soft ‘feminised’ men and the activities of what he regarded as aggressive organised Jewry. These enemies, within and without, have to be overcome by constant vigilance and struggle. Marx has been deified by his admirers and demonised by his detractors, but very little is known about the man himself. He was a journalist, a political activist, a lively polemical writer - and a loving husband and father. 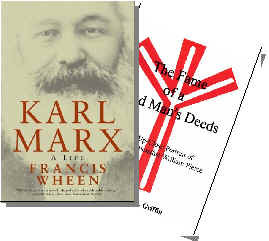 In this absorbing biography, Francis Wheen helps us to get inside the mind of Karl Marx the man. Like Marx, Pierce has been demonised as an evil manipulator, pulling the strings of ‘hate groups’ all over America. Professor Robert Griffin wanted to cut through the distortions and propaganda to see what really makes William Pierce tick. To do this, he spent a month during 1998 in the company of Pierce, his wife and his colleagues at his community in rural West Virginia. He read and analyses Pierce’s own writings, his radio broadcasts and the books that influenced his political and religious worldview. He conducted hours of interviews with his subject to try to get to the bottom of the man who came through the conservative John Birch Society and later the American Nazi Party to found his own organisation, the National Alliance, which has been dubbed the most dangerous ‘hate group’ in North America. It seems to me that Griffin pulls it off. Perhaps he could have been a little more critical at times, but he’s done it. We really do understand that Pierce’s primary motivation in establishing his political organisation and his ‘Cosmotheist’ religion was the survival and prosperity of White America. To Pierce, the ‘fame of a dead man’s deeds’ is to have his part in his people’s salvation remembered. Engels declared that Marx’s name and work will endure through the ages although Wheen argues that Marxists and Marxism have given Marx a bad name. How will Pierce’s name endure? Ask us in fifty years’ time! Both books are well-written, empathetic and absorbing. Their subjects were both extraordinary men with a lot of insight into the nature of the problems of human society. Neither man had the whole story, although their most fervent disciples will tell you otherwise. Wheen brings to his book a rather heavy-handed sense of humour, which can sometimes grate on the reader, but that’s just a minor niggle on my part. No distracting footnotes disfigure Wheen’s narrative, but any reader referring to the fascinating endnotes can check out documents quoted. It is also well indexed – a tool neglected by Griffin in his book.